One thing you might ask before replacing your urethane bushings is: “What grade urethane do I need?” To help with this, check out our other posts on urethane: Polyurethane 101 & SURE Urethane 2013. My name is Nick, Assembly Manager here at SURE Motorsports. 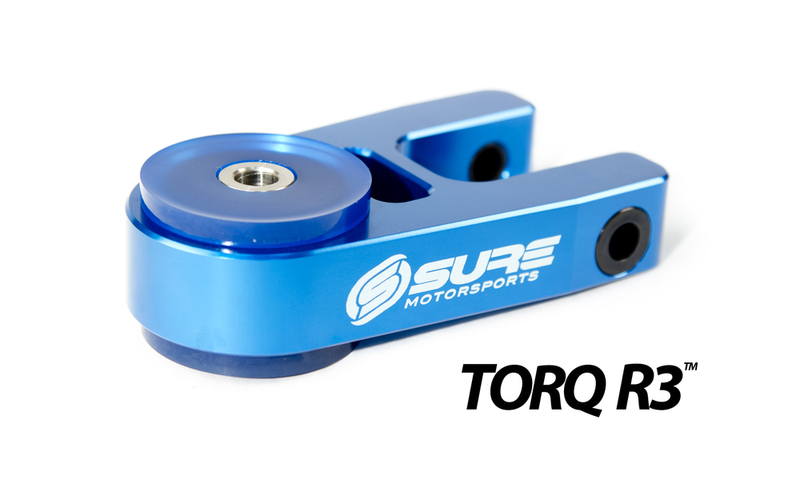 Below is my step-by-step rebuild guide for our Torq R3 engine mount. Quick notes: Make sure your engine mount is not hot before handling. For this DIY, an arbor press is recommended, a vice may also work. Only use water as lubrication. 1. Remove the bolt sleeve; use an object to press the bolt sleeve out of the urethane. 2. Remove the polyurethane pucks. Clean the mount and bolt sleeve as needed. 3. ONLY use water as a lubricant. Press the replacement urethane in so they are flush to the mount housing. NOTE: Other lubricants can cause urethane to slip out of the mount and also break down the urethane. 4. Use the arbor press to reinsert the bolt sleeve. Make sure the bolt sleeve is completely flush with the mount. And there you have it, your replacement urethane is now installed. Check out the demonstration video below and stay tuned for more informational DIY posts in the future! Posted on May 1, 2013 by JATO.